Ray Vester served on the Arkansas State Plant Board for 18 years. "It's self-governing, by the people, for the people," he says. Terry Fuller, a farmer and seed dealer in Poplar Grove, Ark., voted for tight restrictions on dicamba use in the state. 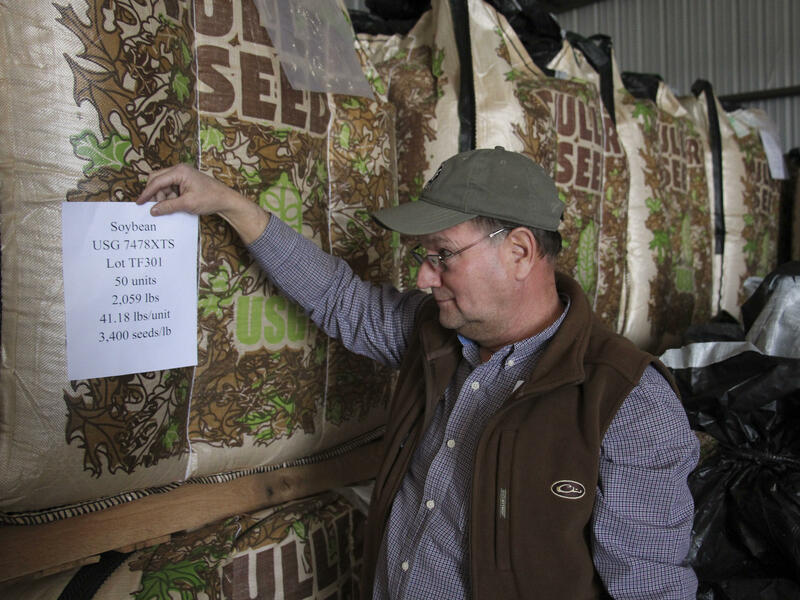 Terry Fuller has bulk bags of soybean seed in his storage shed at Fuller Seed and Supply, in Poplar Grove, Ark. Some varieties of soybeans have been modified to be unaffected by dicamba. Members of the Arkansas State Plant Board listen to a presentation by Monsanto executive Ty Vaughn (standing) in September 2017. Some farmers have put up signs on their fields protesting the plant board's decision to stop the use of dicamba on soybeans. Terry Fuller and his identical twin, Jerry Fuller, grow soybeans and raise cattle near the tiny town of Poplar Grove, in eastern Arkansas. A big part of their business, though, is selling seeds to farmers. And in their storage shed, Terry Fuller shows me the product that has turned neighbors against one another and provoked that fight with Monsanto. The product is soybean seeds. Fuller leans over and reads the label on one large bag. "7478XTS, so that is an Xtend soybean variety right there," he says. "That's dicamba-tolerant." Dicamba is a herbicide. It kills what farmers call broadleaf plants, a category that includes many weeds as well as crops like soybeans. Not these soybeans, though. Monsanto tweaked the genes of these varieties, and now dicamba doesn't bother them at all. It means that farmers can plant these seeds and spray dicamba on their fields as the soybeans grow, and the weeds will die, but the crops are fine. When Fuller heard about this invention a few years ago, he thought it was great. 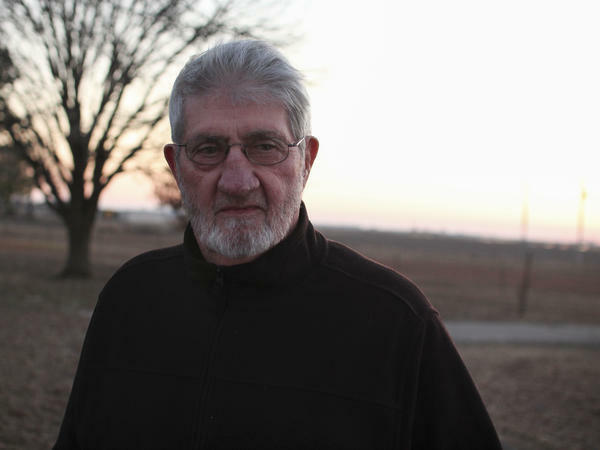 "I absolutely wanted to spray dicamba in Arkansas and the rest of the nation," he says. Farmers began spraying the chemical on their fields last summer, and they say it worked splendidly. The problem was that when the weather turned hot, the weedkiller didn't stay where it was supposed to. It seemed to evaporate and drift, sometimes for a mile or more, into fields of other crops that can't tolerate dicamba. It left those crops stunted or with curled up leaves. "I could not walk out of my house without seeing damage," says Fuller. Drifting dicamba hurt soybeans, backyard tomatoes, melons and orchards. Millions of acres of crops were affected, from Mississippi to Minnesota. It was a fiasco. And Terry Fuller had the power to stop it — at least in his own state. He's a member of the Arkansas State Plant Board, which regulates pesticides and seeds. "I'm charged with protecting the citizens of the state of Arkansas, and it appears that I wasn't doing a very good job of protecting the citizens and can't even protect myself," he says. Even trees in his own yard showed symptoms of exposure to dicamba. This board on which Fuller serves is an unusual institution. Its meetings are public. The members — all men at the moment, mostly from small towns across the state — sit around a big table. They include farmers, seed dealers and a few people who work for big chemical companies. All of them volunteer their time. Two nonvoting university scientists are on the board, but there are no lawyers and no politicians. And the members are proudly independent. The board is "self-governing, by the people, for the people," says Ray Vester, who represented rice farmers on the board for 18 years, through 2016. Vester says it's the best system of regulation he has ever seen. "Every other state, their boards are politically appointed by the party in power," he says. "The board is made up of a wealth of the experience," says George Tidwell, who runs a crop-dusting business and served on the board for 24 years, 15 of them as chairman. "Anything that came before the board, one to a half-dozen board members had personal experience with it. That's the beauty of this board." As pesticide regulators across the country debated how to respond to the dicamba debacle, Monsanto argued that the product can be used safely. The problems in 2017, the company said, were the result of mistakes in applying the chemical. In most states, regulators decided to let farmers continue to use dicamba but with some additional restrictions on how it's used. In most states, that decision was made behind closed doors. In Arkansas, though, the plant board argued about it around that meeting table — and anyone with an opinion could drive over to Fuller Seed and Supply, in Poplar Grove. "We had as many as 15 people at the office before seven o'clock in the morning, all waiting to see me, all on one side of the issue or the other," says Fuller. In the end, the board decided that dicamba could not be adequately controlled in hot weather, and it banned dicamba spraying during the entire growing season, from April 15 through October. These are the toughest restrictions in the whole country. Fuller and his fellow board members now are facing attacks from almost every side. Monsanto sued the board and each individual member, calling their decision arbitrary, capricious and unlawful. Hundreds of farmers who say they need dicamba to control their weeds signed a petition calling for the board to reconsider. Six farmers also filed a lawsuit, arguing that the makeup of the board violates the Arkansas Constitution because some of the members are selected by industries that the board regulates. "We got angry; we didn't feel that we were able to be heard," says Michael McCarty, one of the farmers. McCarty and the other farmers are proposing a compromise. They want the board to allow spraying of dicamba at least during the first part of the growing season, up to May 25, when the weather is not so hot and dicamba isn't so prone to drift. "It gets very emotional," McCarty says. "We like seeing our fields clean. We like them to be weed-free. And it was a beautiful area last year" when farmers were able to use dicamba on their soybean fields. There is a chance that the plant board itself may not survive in its current form. Proposals have been floated in Arkansas' legislature to move the board inside the state Department of Agriculture, make it less independent. Fuller says the conversations he has had with neighbors and customers about the issue have been civil and neighborly. But he knows that some people are angry. "There's two loaded guns in my office," he says, and he chuckles. "I felt personally threatened somewhat." He doesn't regret his vote to shut down dicamba spraying. "I put forth a good effort, to the best of my ability, to protect the citizens of Arkansas," he says. In the state of Arkansas, there's a kind of David versus Goliath battle underway, a battle over a weed killer. On one side, there's the giant company known as Monsanto, on the other, a group of farmers and business-owners who regulate the use of pesticides in the state. They have banned Monsanto's latest way of killing weeds, and the company is fighting back. NPR's Dan Charles has the story. DAN CHARLES, BYLINE: Terry Fuller never intended to pick a fight with a billion-dollar company. TERRY FULLER: I didn't feel like I was leading the charge. I felt like I was just trying to do my duty. CHARLES: Terry and his identical twin, Jerry, grow soybeans and raise cattle near Poplar Grove in eastern Arkansas. But a big part of their business is selling soybean seeds to other farmers. FULLER: These are our beans that are for sale. FULLER: 7478XTS. So that is an Xtend soybean variety right there. CHARLES: Dicamba is a herbicide. It kills what farmers call broadleaf plants, including lots of weeds. The Monsanto Company tweaked the genes of these soybean varieties, and now dicamba doesn't bother them at all. It means that farmers can plant these seeds, spray dicamba on their fields as the soybeans grow, and the weeds will die, and the crops are fine. When Fuller heard about this invention a few years ago, he thought it was great. FULLER: I absolutely wanted to spray dicamba in Arkansas and the rest of the nation. CHARLES: Last summer, farmers started spraying dicamba on their crops. And they say it worked. The problem was when the weather turned hot, the weed killer didn't stay where it was supposed to. It seems to have evaporated and drifted sometimes for a mile or more into fields of other crops. Dicamba fumes left those crops stunted or with curled-up leaves. FULLER: I could not walk out of my house without seeing damage. CHARLES: Dicamba hurt fields of soybeans that couldn't tolerate the chemical, backyard tomatoes, orchards, millions of acres of crops from Mississippi to Minnesota. It was a fiasco. And Terry Fuller had the power to stop it, at least in his state. He's a member of the Arkansas State Plant Board, which regulates pesticides and seeds. FULLER: I'm charged with protecting the citizens of the state of Arkansas. And it appears that I wasn't doing a very good job of protecting the citizens and can't protect myself. CHARLES: Even trees in his own yard were damaged. 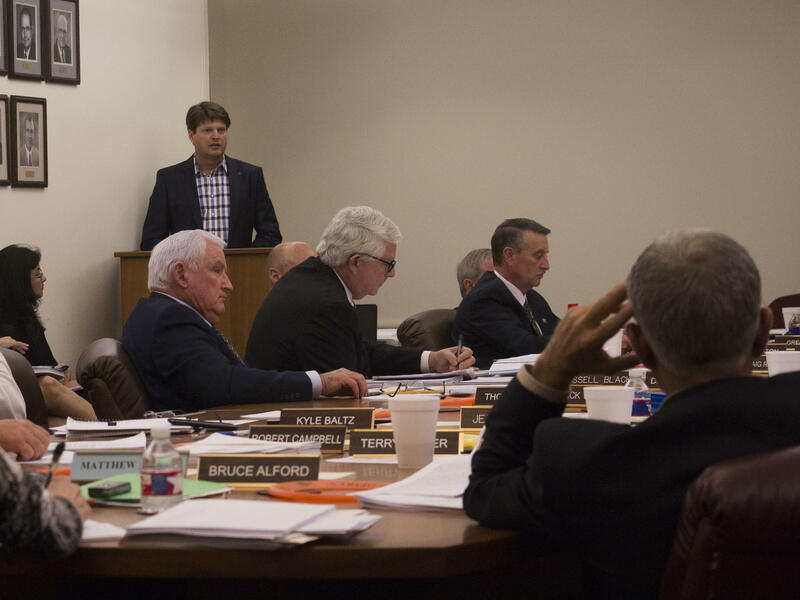 The Arkansas State Plant Board's an unusual institution. It meets in public. The members sit around a big table - farmers, seed dealers from small towns across the state, a few people who work for big chemical companies but no lawyers, no politicians. All of them volunteer their time. And they're proudly independent. RAY VESTER: Self-governing by the people for the people. CHARLES: This is Ray Vester, a rice farmer who served on the board for 18 years until last year. He says the plant board is the best system of regulation he's ever seen. VESTER: Every other state - their boards are politically appointed by the party in power. CHARLES: Now, Monsanto says dicamba can be used safely with better training. And in most other states, regulators looked at this question behind closed doors and decided, OK, farmers can keep using dicamba with some additional restrictions. In Arkansas, though, the debate was very public. Through the fall, the plant board argued about it around that meeting table. And anybody with an opinion could drive over to Fuller Seed and Supply in Poplar Grove. FULLER: We had as many as 15 people at the office before 7 o'clock in the morning all waiting to see me all on one side of the issue or the other. CHARLES: In the end, the board decided that dicamba could not be controlled, so spraying would not be allowed during the entire growing season from April 15 through October. These are the toughest restrictions in the whole country. And the board is now under attack. Monsanto sued the board and each member individually, calling their decision arbitrary, capricious and unlawful. 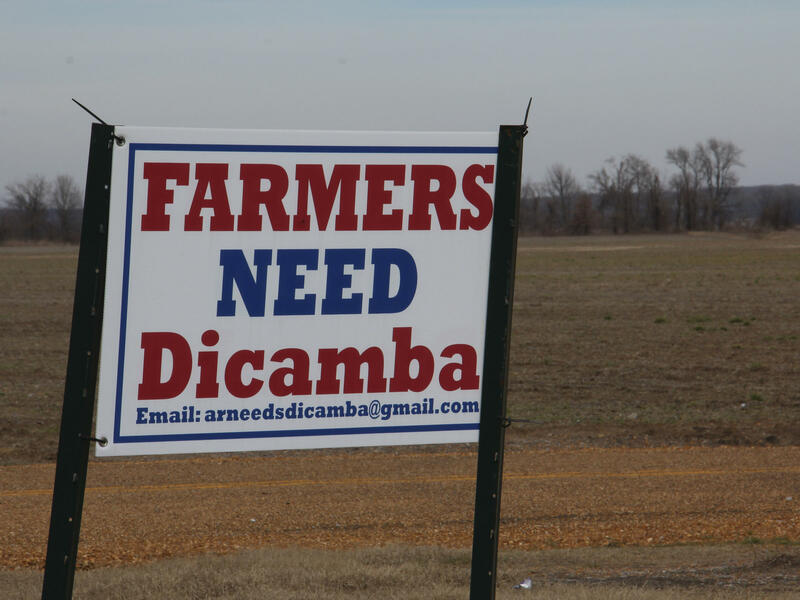 Hundreds of farmers signed a petition saying they need dicamba. Michael McCarty was one of them. MICHAEL MCCARTY: We got angry. We didn't feel like we were able to be heard. CHARLES: They wanted the board to allow spraying at least during the first part of the growing season when the weather's not so hot and dicamba isn't so prone to drift. 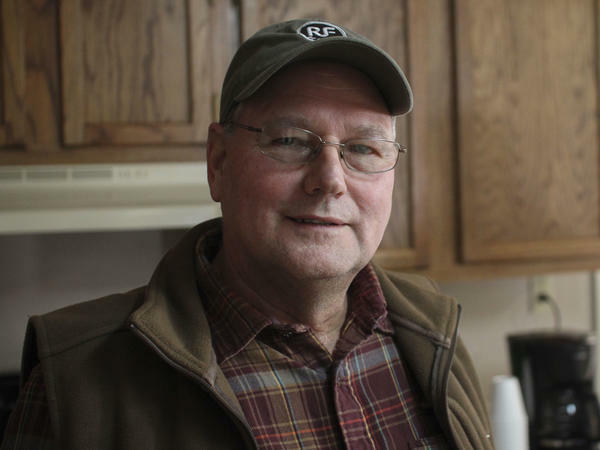 McCarty and five other farmers also sued the board. MCCARTY: It gets very emotional. We like seeing our fields clean. We like them to be weed-free. CHARLES: There's a chance the plant board may not even survive in its current form. There have been proposals in Arkansas' legislature to move the board inside the Department of Agriculture, make it less independent. Terry Fuller says he doesn't think he's lost any friends over this controversy, but there are some pretty angry people out there. FULLER: There's two loaded guns in my office (laughter). I felt personally threatened somewhat. CHARLES: He doesn't regret his vote to stop dicamba-spraying, though. He says he's just trying to protect the citizens of Arkansas. Dan Charles, NPR News.